Below is a list of 25 Important questions that is asked in almost every financials technical interview question. I have also included some of the functional questions that are asked.Answers are included. Qns: What is Flex field? What are different types of Flex field? Ans: Flex field is used to capture information of your Organisations. Qns: Difference between KFF and DFF. Qns: How many KFF are in GL. AP , AR. Qns: What is symbol of DFF in the Forms? Ans: Square Bracket [ ]. Qns: What is structure of KFF in the Accounting Flexfields. Qns: How many segments are in AFF. Ans: max 30 segments and min two. Qns: What are flexfield Qualifiers. b) Cost Center segment Qualifier. c) Natural Account Segment Qualifier. Qns: What is Dynamic Insertions? Ans: u can create Code Combinations at run time. Qns: In which table Code Cominations id is stored. Qns: In which table flex values are stored. Qns: What is set of Books and in which table set of book is stored. Ans : Set of Books is a Financial Reporting entity which Consist of three C.
Qns: In which table Currency and Period Type Name are stored. Qns: In which table Segment Values are stored and concatenated values are stored. Qns: What are different types of Currency. Qns: What are different types of Calendars . Qns: How will you attach set of Books to the Responsibility? Ans: through Profile. GL SETS OF Books Name. Qns: What is Profile and what are different types of Profiles. Ans: Profile: Profile is the changeable option that affects the way your application runs. There are two types of profile. 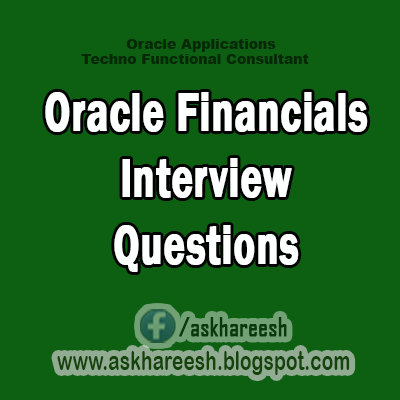 Qns: What are different Profiles Level available in oracle apps. Qns: Write Name of some Profile options. 3. MO:Operating unit (multi org). Qns: What is cycle of GL.? Qns: In Which tables Journal entries created. Qns: After Posting data goes in which tables. Ans: GL_BALANCES. ( Column Period_net_cr, period_net_dr). Qns: What are Important tables in GL. Qns: In which table Supplier information's is stored. Qns: What is difference org_id and Organization_id. Ans: Org_id is for operating unit and organization_id is for inventory organization.